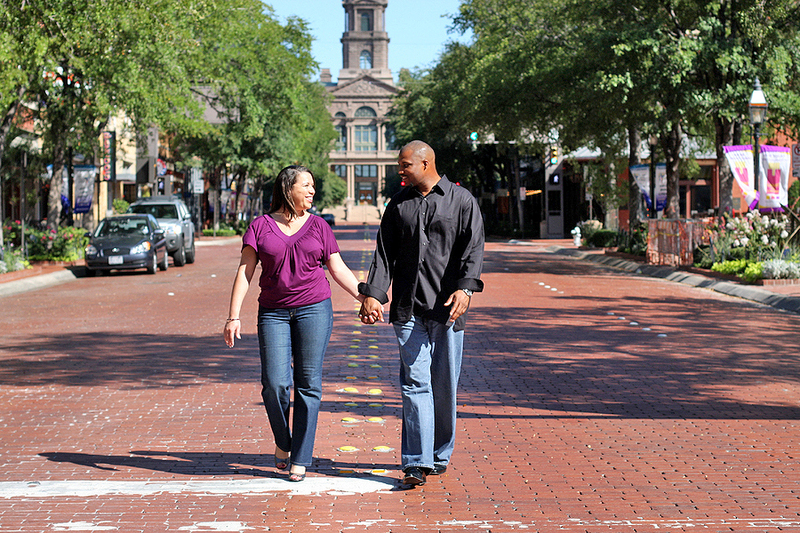 For the couple seeking a mixture of beauty and energy as the backdrop for their engagement photo session, explore the Uptown district of Dallas. Marked by its youth and vibrancy, this section of the city offers exciting possibilities for your pictures. Your first stop will be at the very corner of this district, a priceless vantage point for beginning your engagement session pictures. Bring your photographer to The Stoneleigh Hotel & Spa. This cultural city landmark hearkens from 1920s America of art deco design and fashionable local luxury. Pause first with the hotel’s façade in your background, allowing your photographer to arrange a close up shot of you with this architectural gem as a distant backdrop. Let the classic lines of the dramatic structure lend an urban tone to your first engagement photos. Move next into the main lobby of the Stoneleigh where the height of the ceilings and strategic design of floor space is strongly evocative of its art deco past. Lounge on one of the satin tufted divans for a few poses, making sure to capture the imposing pillars that flank you and the classic chandeliers above. After several shots, move through the Bolla Hallway, pausing for a beautiful photo beneath the ornate arched entrance. If your timing is on target, you will reach the Bolla Bar and Bolla Lounge on an off hour, leaving the setting to your own devices without the distraction of many guests. Capture a few chic poses with the curved lines of the bar stretching behind you. Arrange yourselves on one of the sleek couches with the gorgeous windows arching in the background. After finishing in the lounge, move finally out to the Bolla Patio to capture a few remaining shots. Have your photographer capitalize on the merging of historical urban architecture and beautiful landscaping that characterizes this patio area, the perfect setting for capturing the timelessness of this new phase in you r lives. The Stoneleigh’s location on the verge of the thriving Turtle Creek neighborhood gives it an incredibly unique position near colorful boutiques, galleries, museums, and trendy shops. If you have time and want to expand this stop along your engagement photo itinerary, take an hour to explore Turtle Creek, the popular pet name for the Uptown section of the fashionable Oak Lawn area of Dallas. Collaborate with your photographer to select several building facades and idyllic street corners to serve as backdrops for a few photo poses. West End Marketplace opens into a breathless network of tree-lined streets amidst stunning historical Dallas architecture. Pose beneath one of many beautifully renovated buildings for an elegant urban feel. If you are seeking a decidedly local ambiance, have your photographer arrange a pose with the brick Cinema 10 rising above. For an iconic photo opportunity, capture a few whimsical poses beneath the corridor signaling the entrance to The West End district. Arches frame the brick street sandwiched between classic buildings, creating stunning possibilities for unique perspective and camera angles of the engaged couple alone. Continuing through this section of the Oak Lawn area, move next to Dealey Plaza, the central point where Main Street, Elm Street, and Commerce Street converge. Preserved as a national historic landmark, this serene area in the middle of Dallas’s west end provides a soothing blend of foliage and historic cityscape to create an inherently Dallas photo background. Choose a rolling grassy knoll for a seated or reclining shot, letting your eyes focus on one another as your photographer captures a few shared private moments. For the contemporary and culturally-minded couple, the Dallas Art District is a photography session must. The artsy yet classy vibe of this area will not disappoint in supplying numerous trendy background opportunities. 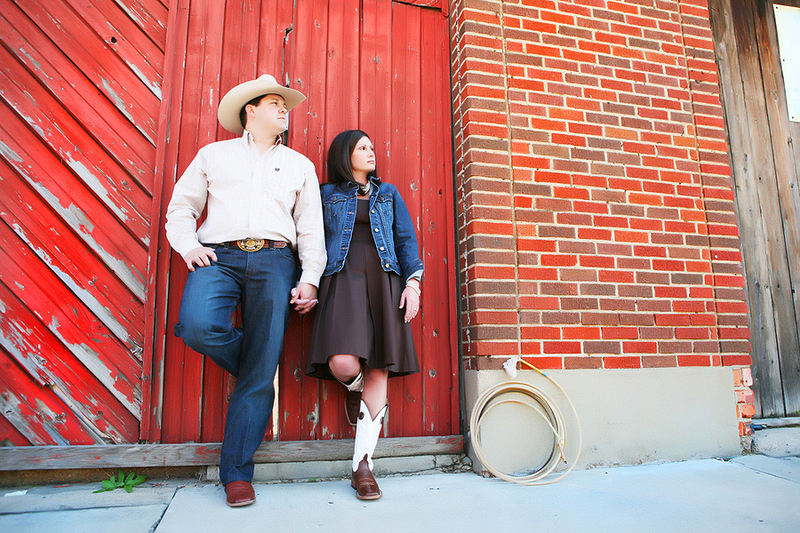 Your next stop for your engagement photography session is only one mile from the Stoneleigh. Move now from the chic Turtle Creek neighborhood to the modern timelessness of the Dallas Museum of Art. This contemporary structure presents an intriguing contrast to the more vintage feel of your earlier backgrounds and allows your engagement photography to assume a new, more surprising direction. Have your photographer arrange your first pose at the east entrance beneath the red steel modern sculpture. 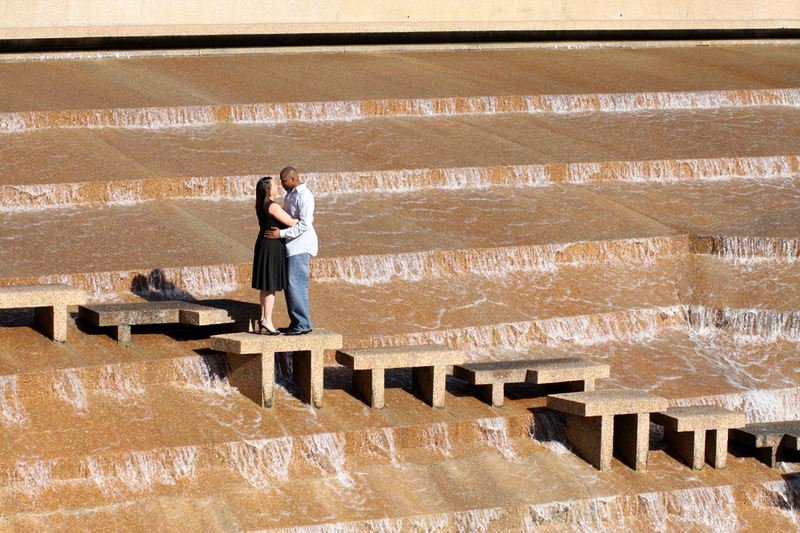 The industrial character of the sculpture lends a stark contrast to the intimacy of your engagement moment and simultaneously roots your relationship in the urban nature that uniquely characterizes Dallas. This perspective also provides stunning vantage points for part of the city skyline with glassy buildings arching in the distance. After several shots from this side of the museum, move to the more conventional entrance fronted by a fountain and revolving doors. Capture a few poses with the fountain as backdrop and the lines of the museum entrance arching beyond.